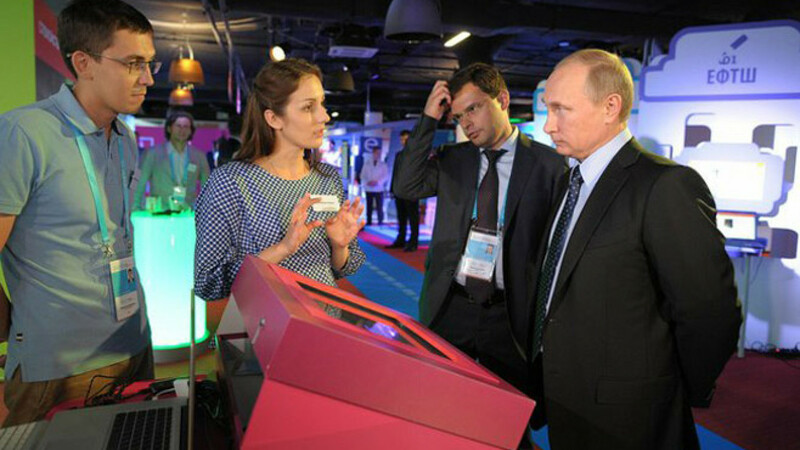 Putin meeting with businesspeople at an Internet start-up forum on Tuesday. President Vladimir Putin — known for being wary of the Internet, which he once called a CIA project — on Tuesday recognized the industry as an important part of the Russian economy and said the government's restrictions on web content will not restrict civil liberties. The Internet has been transformed from a mere means of communication between people into a very profitable business in Russia, while the entire online sector accounts for 8.5 percent of the country's gross domestic product, Putin said at a meeting with top industry managers, who used the opportunity to tell the president about their professional triumphs and failures. With 61 million users, Russia is Europe's fastest-growing Internet audience, according to a 2013 report by industry body comScore, and some key players in the sector attribute this success to a lack of state interference. "Russia is one of the few Internet markets that boasts its own online services in almost every area. This was possible not because of some protection or support but because the industry was allowed to develop on its own in a competitive environment," said Arkady Volozh, founder and CEO of Yandex. Russia has its own answers to Facebook, Google, and Amazon in the form of Vkontakte, Yandex and Ozon. The country now has a good chance of expanding its products to other markets, the executives said. This process is already under way. "Today you can go to Istanbul airport and find out that taxi drivers are using Yandex.Probki [traffic service] to navigate the city," Volozh said. He also said the expansion of Yandex's presence outside Russia is vital because it can give Internet users more options. "Only four countries in the world can choose between search engines. For others, there is only one service they can use," Volozh said. Russian Internet giant Mail.Ru is also going global. The company is successfully growing in the U.S., Canada and many European countries and has already forced a number of start-ups from those markets, said Dmitry Grishin, co-founder and CEO of Mail.Ru Group. Grishin said that Russian companies have competed well internationally because they were allowed to develop in an open and free environment. Most businessmen operating in the sector concur that contact with state authorities can only have a negative impact, he added. Putin agreed that while excessive government interference is detrimental, at least some degree of Internet regulation is unavoidable. "Every day a third of our population uses the Internet one way or the other, which is what we are talking about here. Of course it requires some regulation," the Kremlin's press-service cited Putin as saying. Federal Mass Media Inspection Service already has the right to ban websites containing extremist content without obtaining a court order, prompting fears in the Internet community that bloggers and opposition leaders would face increasing persecution. Just last month Putin signed a law requiring websites that attract more than 3,000 daily visits to register with the regulator as a mass media outlet. Search engines have already said they will refrain from posting news on their websites if that demand is made of them. However, an amendment that is currently under consideration would allow search engines to be called news aggregators, which would exempt them from these procedures. Putin said the government's restrictions are not aimed at hurting businesses or violating people's rights, but are meant to protect children from harmful influences on the web. "We have debated these restrictions on pedophilia, on the promotion of drugs, terrorism or advocating suicide a lot," Putin said. "But listen, we are all grown-ups, let's stop. Let's leave our children in peace."